Take a pleasant trip in time and around South and Central America with one of Disney’s most popular character and learn about the different cultures in the process. Walt Disney’s Classic Caballeros Collection DVD Offers great entertaining, laughs, music, and culture for the whole family. It features two unforgettable classic movies: Saludos Amigos and The Three Caballeros, even though this movies are almost 64 years old and look like a documentary, they still will managed to entertain and amused the whole audience, with colorful graphics, great animation, and magnificent music. It is with out a doubt a most have for Disney fans, not only for the story and message of friendship, and unity that all Disney movies depict, but also for the cultural and technical value it possesses. The DVD will be available on April 29 2008. In Saludos Amigos and The Three Caballeros, we will join Walt Disney himself, a group animators, Goofy and Donald Duck in a trip around South America most important countries and landmarks such as Brazil, Argentina, Lake Titicaca, and the Andes. The movies are shown in different segments combining animation with real people, in which our main Characters learn and explore around the different countries while meeting new characters like Joe Carioca, Pedro the Airplane, Panchito Pistoles, Pablo the penguin, and many more. Each segment is dedicated to a different country and comes with an spectacular live action musical chorography, where Donald and one of the new characters, which depicts the country’s people and costumes, interact with the dancers and singers by joining the show. The movies are incredible, we can see the visionary mind of Disney in each one of them, not only in its entertaining and instructional value, but also in a technical and aesthetic sense as well. There is not news that Disney has been a pioneer in animation, but the way he combined live action with animated character is amazing, keep in mind that these movies were made in the 40s. Donald and the other characters movements are impressively coordinated with the real actors, not only that also the settings are incredible ingeniously depicted. When The animated character are in the real world it seems as they really were, and when the actors are in the cartoon world it also seems as that world existed. Visual and audio wise is marvelous, Disney at its best, each animated segment is full of color and splendor, this combined with the music makes each musical number a beautiful story to be remembered for a long time. 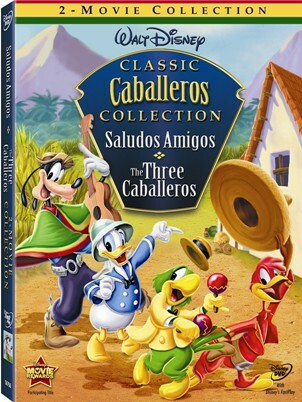 In conclusion the Caballeros Collection is a great addition to any DVD collection, even if you are not a Disney fan. The movies are way ahead of their time visually and technically speaking. The music and the sound will bring these movies to life. It is a wonderful experience that takes a blow to the audiences mind leaving them asking for more. The movie is like being on Magic Kingdom’s ride It’s A Small World but with better visuals and songs. English, Spanish and French (Dolby Digital). SPECIAL FEATURES: The DVD is loaded with good special features. As all Disney DVD’s it is equipped with the fast play option. A Walt Disney CBC interview and many more. The special features are one of the most complete feature that I found in many DVD’s for a long time. It is not just fill-up material.